Aji Cachucha is a small, mild pepper used in many traditional Caribbean dishes. The pods ripen from a light pale green to a yellow/orange. 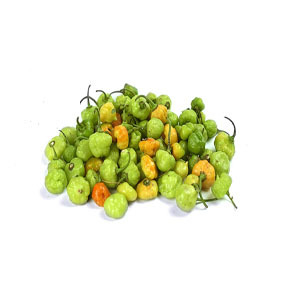 The pepper may be confused with the similar looking Scotch Bonnet and habanero pepper but is not as hot. The ripe fruits are orange, from 4 to 6 cm in length and 2-3 cm in diameter; They weigh between 6 and 12 grams and come to produce between 30-52 seeds / fruit. Names: aji cacucha, ajicito, aji dulce, aji gustoso. Source: South America, Cuba, Dominican Republic, Puerto Rico. Handling: Ají Cachucha is used to season dishes in Puerto Rico, Dominican Republic and Cuba. One of the most common uses is as an important ingredient for sofrito, a sauce used in several Latin American cuisines. Optimum storage temperature for storage of peppers is 45 – 50 F°.